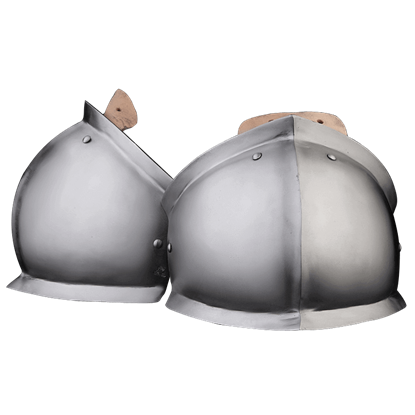 Rigid plate armour to complement chainmail quickly gained popularity in the mid-1200s. 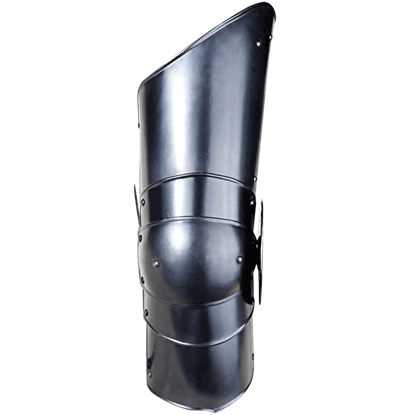 The 13th Century Poleyns are inspired by illuminations, funerary sculptures, and other artworks showing this sort of knee protection. One of the oldest complete sets of armour in the world, the Avant armour is named for the inscription on the breastplate meaning, Forward! The 15th Century Avant Milanese legs consists of polished steel cuisses and poleyns. Any warrior in battle, from the lowliest foot soldiers to the most trained knights, knew that protecting ones knees was important. 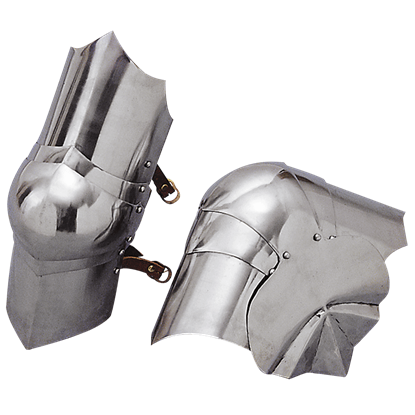 That is why many warriors chose to wear protections like these 15th Century Foot Soldier Knee Guards. Stay mobile on the battlefield by protecting your legs like the assets they are! 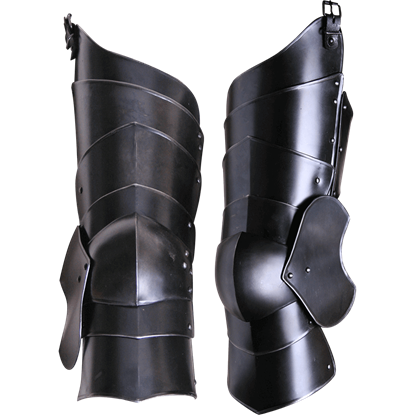 The Blackened Balthasar Full Leg Guards cover a generous portion of your upper thigh, knee, and part of the lower leg with steel plate armour. Make sure you do not take an arrow to the knee during your next battle by adding the Blackened Conrad Knee Protection to your warrior ensemble! 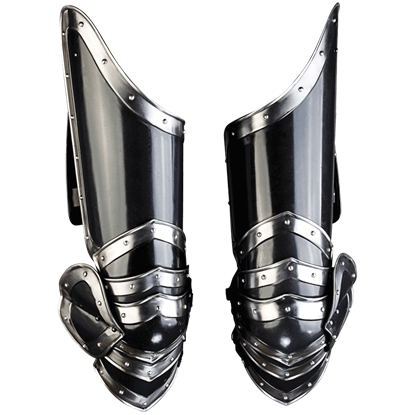 The steel knee armour displays a dark metal finish perfect for mercenaries and rogues. 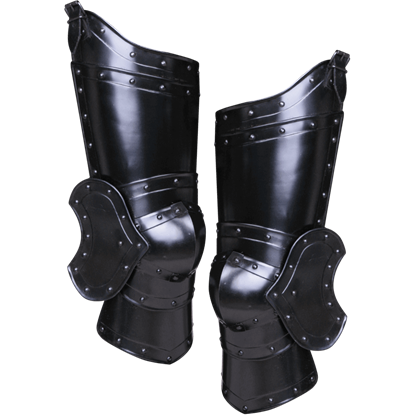 The Blackened Gustav Full Leg Guards are ideal for protecting as much of your legs as possible during light historical reenactment. 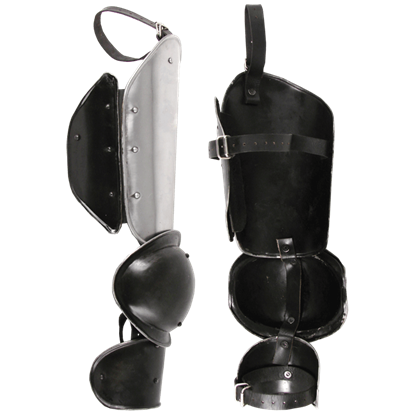 Made of 16 gauge blackened steel, these leg guards feature a round plate for guarding the knee. 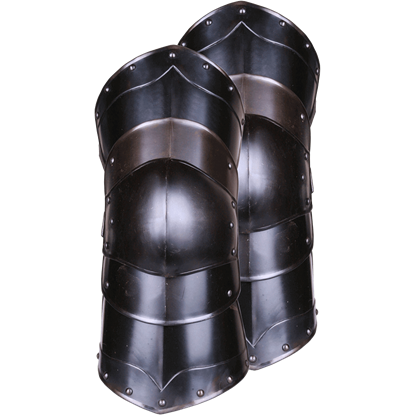 Simple yet effective armour for the thigh and knee, the Blackened Markward Full Leg Guards offer excellent protection on the battlefield. 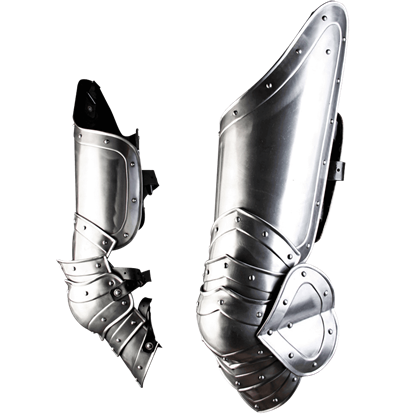 The steel leg armour consists of eight pieces, a design which grants great flexibility. No soul is pure evil, but yours comes close. A wicked knight deserves armour to match a black heart. Onlookers must instantly comprehend your dark role. 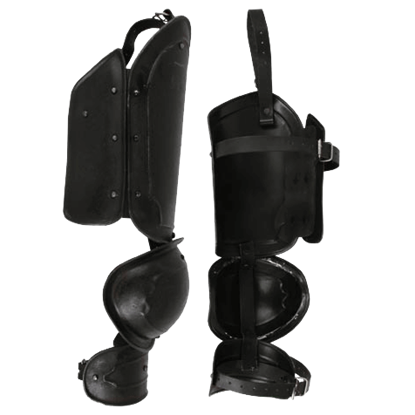 Keep a steady foot down the heinous path with the Edward Darkened Leg Guards. The chivalrous knight walks a path filled with dastardly things. Bandits, dark knights, and dragons are expected. Do not be concerned, you are no weak knee warrior. 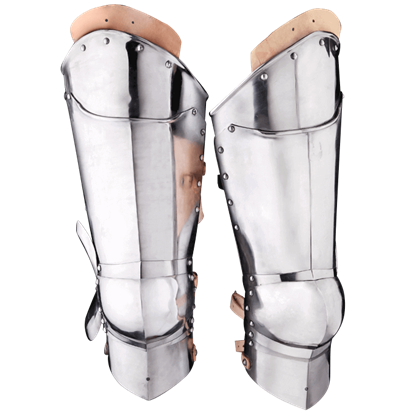 You shield your mighty limbs with the Edward Steel Leg Guards. If you think about it, your knees are very important when it comes to combat. If you take out a warriors knees, they are bound to crumple to the ground. 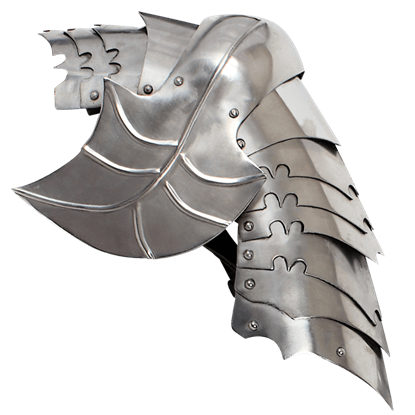 That is why this Fantasy Leg Armour is integral to any warriors armored attire.